Still, Cara isn't sure what to think when she meets Aelyx. Humans and L'eihrs have nearly identical DNA, but cold, infuriatingly brilliant Aelyx couldn't seem more alien. She's certain about one thing, though: no human boy is this good-looking. Cara finds support in the last person she expected. She realizes that Aelyx isn't just her only friend; she's fallen hard for him. but Aelyx has been hiding the truth about the purpose of his exchange, and its potentially deadly consequences. Soon Cara will be in for the fight of her life - not just for herself and the boy she loves, but for the future of her planet. Cara is a model student, and she has big dreams. But after her mom's illness, she needs financial resources to make it happen. She may not be happy about it, but hosting exchange student / alien Aelyx might just be the springboard she needs to launch her dreams. Just imagine the blogging possibilities! Nothing is ever as straightforward as it seems, though, and soon Cara realizes that her town is full of speciesist nuts who consider her a species traitor, even though the decision to play host was entirely out of her control. As Cara and Aelyx grow closer, her family is torn apart by those who don't welcome aliens in their community . . . and no one knows just how far they'll go to make that point clear. Is there a rating above five stars aka loved it? Because I was all over this book like a fat kid on cake. I may have already re-read it once while wallowing in Star-Crossed withdrawal, and I normally have enough self-control to not re-read books within the same calendar year. P.S. : whoever was responsible for Star-Crossed's cancellation is a big fat jerk. Come to think of it, same goes for whoever was responsible for Roswell's cancellation. Somebody needs to bring science fiction romance back to the small screen! 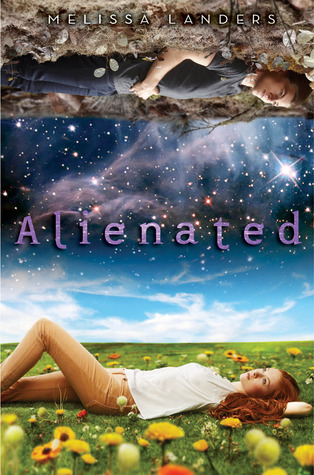 Alienated reminds me a bit of Generation Dead by Daniel Waters, which is another book that took me completely by surprise with how much I liked it. The two books share the common theme of civil rights for those who are not-quite-human. Both books draw obvious parallels to the black civil rights movement of the 20th century and the gay/lgbt civil rights movement of today. The historical parallels are a good reason to pick up the book, but you'll stay for the cute romance! It takes a while, but seeing Cara and Aelyx learn about each other and start making an effort to connect is simply heartwarming.